Material: The material is natural rubber and coral velvet. This light weight travel mat is made from biodegradable, natural rubber and bonded with ultra absorbent polyester microfiber. Our hot yoga mat is designed to work better and better. Machine Washable: Just throw it into the washing machine then hang to dry. Portable: This portable mat defines safety and comfort in one natural roll. Simply fold or roll your mat to bring both comfort and ease along with you on your fitness journey. Non-Slip: This lightweight mat will provide the cushioning your body needs to enhance proper alignment and maintain poses. Your hands and feet will love the stability that the light-tack non-slip texture brings to your practice. It provides great traction when wet so is perfect for hot yoga. Layer on top of any of our other mats for extra cushioning. Odorless: Free of toxic odors! Non-Fade: We use fade-resistant water-based ink, so your mat will keep looking fresh. 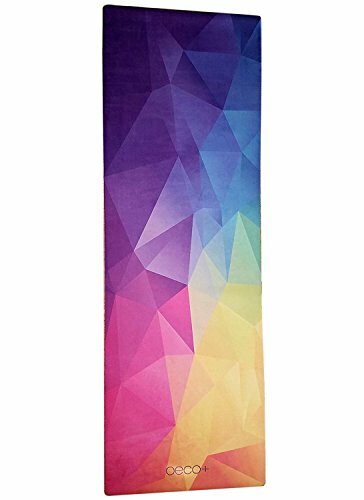 Designed for yoga anywhere, this oeco+ Travel Yoga Mat makes your practically stylish. Accessory Included: Adjustable yoga mat carrier: Fits mat of any size. Optimal 65" length to ensure comfort during transport. Essential Yoga Accessories to transport any Yoga Mat: The light weight mat sling is made from durable cotton that won't slip. Simply loosen the loops slot them over both ends of your best yoga mat tighten the loops and you are ready to go no need for bag. The sling can be worn over your shoulder or across your chest 100% NON-TOXIC: We believe in creating premium quality Eco friendly products that are safe for your body, mind and spirit. The 100% yoga straps is also machine washable for easy cleaning. LIGHT WEIGHT: This mat travels in comfort in one natural roll. If you have any questions about this product by Oeco Plus, contact us by completing and submitting the form below. If you are looking for a specif part number, please include it with your message.